Red, smelly, unclean ears usually mean a Shih Tzu ear infection is brewing and with it comes sensitivity, discomfort, and irritability. If your Shih Tzu has been shaking his head, rubbing or scratching his ears, then he might have an ear problem. Shih Tzu ear infections are one of the most common reasons that their owners visit their veterinarians each year. This is not surprising, because most owners hate to see their poor Shih Tzu suffer. When they have ear problems, their discomfort is hard to ignore. Shih Tzu dogs are prone to infections due to the way their ears hang down. Severe cases can result in loss of hearing and balance, or walking in circles. While rare, some Shih Tzu can shake and scratch so violently they damage their ear flap (pinna). Blood builds up under the skin causing a hematoma to form and giving the ear flap a puffy look. If your Shih Tzu has a problem with allergies, they may end up with an ear infection. Shih Tzu can be allergic to many different things. Anything they come in contact with, inhale or ingest could be an allergen. Their food, grass, pollens, molds, cleaners and other chemicals are common allergens that affect people and dog. House dust and house dust mites are one of the most common allergens. But if you are dealing with ear problems don't rule out the possibility that it could be the food you are feeding. Atopic dermatitis and ear infections are major signs that food might be the culprit. Shih Tzu respond to allergies, though, differently than people. Shih Tzu with two infected ears may be allergic to something in their environment. Sometimes the veterinarian can diagnosis the allergy by treating the ear. To be thorough, the vet will need to treat the allergy and the ear. The main parasite that enjoys the environment inside the dog’s ear is ear mite, Otodectes cynotis. If you have cats, you are probably aware that they are more frequent in our feline friends, but dogs can be affected too. If a Shih Tzu becomes hypersensitive to these mites, their scratching, rubbing and shaking can be so intense that they cause trauma to the ear flap. But fleas will cause the dog to scratch and excessive scratching can also cause injury to the ear flap. 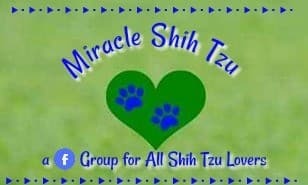 Does your Shih Tzu Like to Swim? Some do, and if he comes in contact with bodies of water regularly, he can be prone to infections. Chlorine in pools can be an irritation. Shih Tzu that swim in lakes or rivers can encounter germs that will thrive in the the warm dark environment of the ear canal. Even bath water can get into the Shih Tzu’s ear creating a warm moist environment for germs to grow. Plain water, however should not be a problem for your Shih Tzu's ears. If your Shih Tzu loves to run in the woods or roll in the grass, he may pick up something that sticks to the ear causing irritation. Dogs will scratch and rub and shake and before you know you have trauma, redness, and inflammation. Plant awns are a typical offender, sticking to your clothing and their ear flaps. So, if you notice them on you, better check the dog. Ticks can find their way into the ear and cause problem. After a fun day in the woods, it is time to check over your Tzu so you can prevent forest hitchhikers from becoming a problem for your dog. 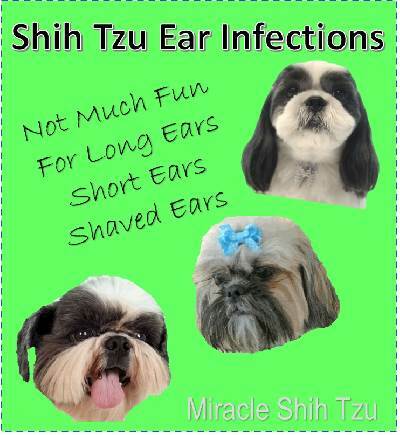 The Shih Tzu’s ear anatomy can play a part in whether or not they will suffer from ear infections. The bacteria and yeast that cause ear infections need a warm, dark, moist location in which to thrive, grown and reproduce. Since Shih Tzu dogs have thick floppy ears, they are more likely to have problems than their cousins with erect ears. However, Shih Tzu are not unique; any long haired dog whose ears hang low are candidates for ear infections. Since the Shih Tzu have hair that continually grows inside the ear canal, it is important to remove the hair, and excessive wax build up to prevent infections from occurring. The ear canal is L shaped in Shih Tzu where it starts in a vertical position and then bends as it nears the ear drum. Humans have a horizontal ear canal. The shape of the Shih Tzu’s ear canal is such that it is difficult to puncture the ear drum, but does make it easy for infections to become established. There are numerous types of bacteria and yeast present in ear infections. Normal healthy ears can live with hundreds of bacteria and not be affected unless something changes. Allergies, hormonal abnormalities, either deficiencies or excess hormones, moisture, foreign objects—anything can change these microorganisms allowing them to grow and multiply rapidly. Sometimes the Shih Tzu’s natural body defenses are just overwhelmed and cannot compensate. Ear infections are the result. Diagnosis varies widely depending on your veterinarian’s facilities. If you suspect a dog ear infection, it is time to call the vet. The vet will examine the ear canal with their otoscope. They can determine the extent of the infection,presence of tumors, parasites or foreign objects and the condition of the ear drum. They may also swab the inside of the ear to view under the microscope. A simple smear observed under the microscope can reveal additional information to the vet. If the veterinarian then fixes and stains this smear, they can determine whether there is yeast or bacteria present. They can identify the type of bacteria and prescribe the correct antibiotic. Sometimes a culture and sensitivity is ordered. This is more costly and time consuming, and the results may not be back for several days. Shih Tzu that have chronic problems where antibiotics have not be useful are prime candidates for this type of lab work. Antibiotics, if used, can be in the form of an injection, pills or liquid given by mouth, or a topical cream or drops applied directly in the ear. If swelling and inflammation are present, the vet may recommend that steroids be given, either orally or by injection. Sometimes they are applied topically. Alternately, the vet may suggest an antihistamine instead of a steroid. A medication is given to kill the ear mites if they are present. A slow change of diet will be necessary if a food allergy is suspected. This can be a long, difficult process, and you may need the help of additional professionals to find the food that is causing the allergy. If an environmental allergy is the problem, eliminating the source can help. This too can be difficult. If your dog has ear infections at certain times of the year, suspect an allergy to something within the environment. Removing fleas from the environment will be necessary if the dog has a super sensitivity to them. Veterinarians treat most ear infections with oral medications, injections, ear flushing or cleaning and topical ear medicines. Surgery is only needed in severe chronic cases. Treating early and addressing any secondary problems leads to the best outcome. If your vet tells you to clean out your dog's ears periodically, you will want to use a good quality ear cleaning. 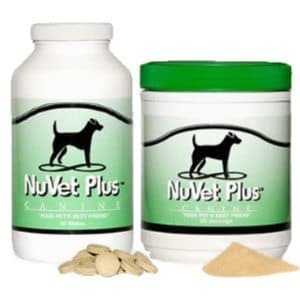 Some ear medications that vets use will preclude you from cleaning the ears but your vet will tell you whether to leave the ears alone or keep them clean. Here is a very simple demonstration that you can use to help clean your dog's ears. If your Tzu is cooperative, you will be able to do this by yourself. If not, you may need someone to help you hold the dog. The towel is to prevent your dog from shaking liquid solution over you and him. Wrap the towel around his head if you suspect this will happen. Hold the ear flap up between your thumb and index finger. Using your other hand add the necessary drops. Find the base of the ear and gently message with your thumb and index fingers. Wipe any access that did not make it into the ear canal with the tissue. Your dog will likely shake, and that will also help distribute the medication. It is never so true as it pertains to dog ear infections. This is one area where owners can save hundreds of dollars in costly veterinary bills. Keep your Tzu’s ear clean and hair free. Remove hairs and use a cotton ball periodically to clean the area of the ear that you can see. Feed a high quality diet. 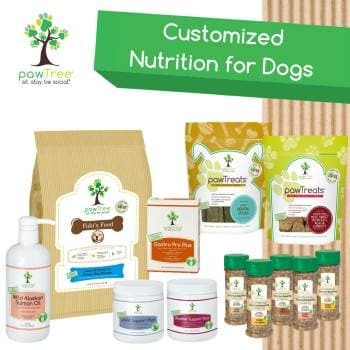 Food allergies especially to ingredients in low quality diets can be a cause of dog ear infections. Check your Tzu thoroughly after any romp in the woods, on the beach or if you notice he has had fun rolling in the grass. Place a small cotton ball into the ear before bathing your dog to keep the ear dry, especially if you soak your dog in a tub of soapy water. Even though ear infections are very common, they should still be taken seriously. Hearing is one of those senses that dogs rely on the most and a dog who cannot hear is not a happy canine. If you do suspect an ear infection, call your vet for an appointment. Diagnosis is relatively easy, and the prognosis is excellent if you treat early. This is usually not a procedure that Shih Tzu dogs love. Most can be taught to tolerate it but some will resist. Slowly plucking out a few hairs at a time will be less painful to the dog than grabbing large chunks of hair. Use your fingers if you are concerned the dog will move suddenly. Delicate ear tissue can be pinched easily with hemostats or tweezers if the dog jerks his head suddenly. In my opinion, black Shih Tzu dogs seem to grow more hair in their ear canals than lighter colored dogs, but all still grow hair continually throughout their lifetime. Apply an ear powder to the canal first and spread around with your finger or a cotton ball. The ear powder will give you more traction and allows you to easier grab and pull the hair. Without the powder, you are trying to pull hair that is moistened with wax—a very slippery job. Some people use corn starch in lieu of commercially available powder. It works reasonably well. Dog Ear infections are common in many breeds but especially troublesome in those breeds where the ears drop down. Infections are normally associated with another problem, often an allergy to something in the environment or the food the dog eats. Prevention is the best way to avoid itchy, painful infections and the best way to do this is to keep the ears clean. Removal of a little of the hair that grows inside the ear canal will allow more air to circulate. Using a good ear cleaner about once a week will keep ears clean and fresh.